Celine has been a student since February 2008. This young rider is a very talented and has goals of making the Region 9 team for NAJYRC in the next couple of years. She has shown through 2nd level on Split Mesquite Farm's Abaris. At 2010 Championships they placed 6th in a very competitive 1st level junior class! 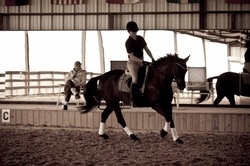 Celine has recently been an integral part starting horses under saddle at Concordia Dressage! We are very proud of her work! Congrats to Celine on the purchase of her new horse, Grenadier! 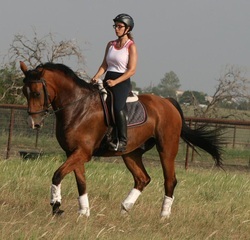 "Gunner" is a 2006 Belgian Warmblood gelding by Fal Turro and out of a Titan mare. Look for them in the show ring soon! Robin has been working with Concordia since fall 2011. She owns two wonderful friesan crosses, Bentley & RubyDeaux. She will be competing both horses in the fall of 2013. 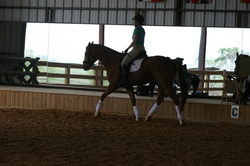 Lauren has been working with Concordia Dressage since spring 2013. She moved her 2001 Oldenburg mare, Coeur Enchante "Caireen" to the farm in May and has been working as a working student all summer. She has been spending much of the summer working with the up and coming three year olds. Lauren competes in eventing. Gaby and her lovely Irish/Arabian mare, Glenlord's Mystique, have been clients since fall 2012. Gaby and Mystic compete in eventing. Gaby also is a fabulous working student for us! Sarah has been a student since spring of 2010. She owns and rides her 9 year old Lusitano mare, Zorra. Teresa owns 5 year old andalusian gelding, Dante RDL. Amber has been a student since fall of 2011. 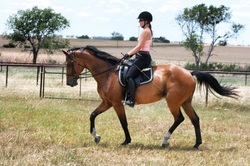 Sherri has been a student since 2008 with her now retired cleveland bay gelding, Trooper. She has recently begun a new partnership with her new oldenburg mare, Rhetabenz. Sherri competes in eventing. 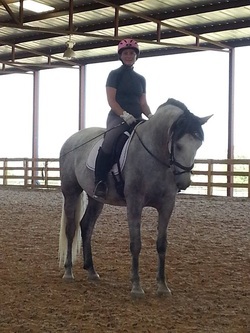 Crystal has been a student since 2008 with her andalusian/quarter horse mare, Grace. Crystal competes in eventing. Mechelle has been a student since December 2011 in September 2012 relocated to Washington state. She and her paint mare, Macrena Bar, will be missed but Jenna will still be teaching Mechelle with regular clinics. Mechelle also has an up and coming young horse, Harvey Bailey, by our very own, Gran Casso! Katie and her mom, Anne-Marie's homebred arabian mare, Damali are a great combination and will begin showing in dressage fall of 2012! 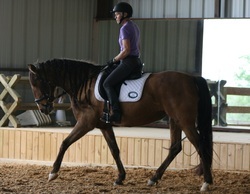 Marcia has been a client since June 2011 with her two horses: hanoverian, Gusty Wind, and dutch warmblood, Ultrazon. She competes at 3rd level. 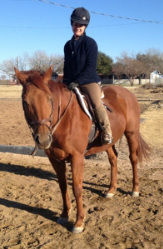 Leslie and her trakehner geldings, Winchester and Weldon, have been clients since spring 2012. Gillian has been a client since spring 2012.